Leave your cares behind and travel to two of the Philippines’ best destinations: Boracay Island and Coron, Palawan. Enjoy the white sand beach, clear blue waters, stunning sunsets and an island vibe like no other. Visit Discovery Shores Boracay, an all-suite property along the white beach, boasting of spacious and stylish beachfront accommodations. For a taste of Paradise, Club Paradise is a tranquil haven known for its spectacular dive sites, outdoor attractions and charming accommodations. The Book and Buy offer of Discovery Shores and Club Paradise is an exciting deal for your Boracay and Palawan getaway. Enjoy a special rate of Php13,500++ per night in a Junior Suite at Discovery Shores Boracay or stay in the newly renovated Garden Suite at Club Paradise for only Php7,500++ per night (minimum stay of two nights). Indeed, an island escape is always a great idea. The “Book and Buy” promo is available until 31 March 2016. Bookings must be settled in full within two days of reservation. For more information, call Club Paradise Palawan at (+63 2) 719.6971 to 74, email at reservations@cp.discovery.com.ph or visit www.clubparadisepalawan.com and contact Discovery Shores Boracay at (+63 2) 720.8888 / (+63 36) 288.4500, email at reservations@dsb.discovery.com.ph or visit www.discoveryshoresboracay.com!. 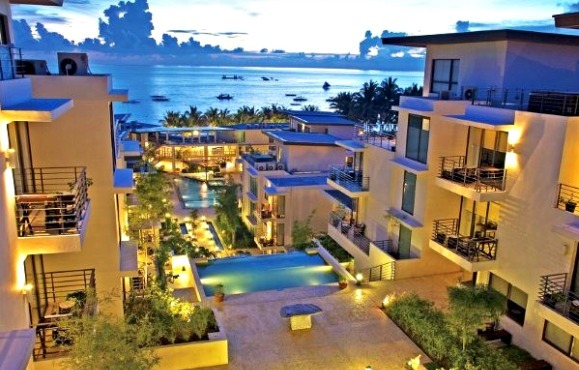 Discovery Shores Boracay is an award-winning 88-suite luxury resort in Station 1 of White Beach. The beachfront property features the highly-acclaimed Terra Wellness Spa and well-loved restaurants Sands and Indigo. The resort is consistently listed in Travel + Leisure’s World’s Best Hotels and is a regular awardee on TripAdvisor. Discovery Shores Boracay is one of five properties of The Discovery Leisure Company’s portfolio of distinctive hotels and resorts, and is a member of Preferred Hotels and Resorts Lifestyle Collection. Get updates through Discovery Shores Boracay’s Facebook on http://facebook.com/DiscoveryShoresBoracay, Instagram @DiscoveryShoresBoracay and Twitter @DiscoveryShores. Club Paradise Palawan is a 19-hectare island resort in Dimakya Island of Coron, dotted along UNESCO’s marine sanctuary. The exclusive property features 55 rooms and cottages with scenic views of nature, as well as a spa, restaurant, and two bars. Coron is a haven for the gentle dugong, colorful flora and fauna, and world-class reef and wreck dive sites. Exciting day trip options include Coron Island Tour, Calauit Safari, Bottom Fishing and Island Hopping. Club Paradise Palawan is one of five properties of The Discovery Leisure Company’s portfolio of distinctive hotels and resorts. Get updates through Club Paradise’s Facebook on http://facebook.com/club.paradise.palawan, Instagram @ClubParadisePalawan and Twitter @_ClubParadise.